Nori (海苔) is a Japanese term used to refer to edible varieties of algae in the various species of the red algae Porphyra, including most notably P. yezoensis and P. tenera. A few other algae are used as well, including some cyanobacteria. 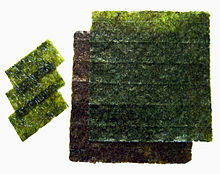 Nori is also commonly used to refer to the food products created from these so-called "sea vegetables". Finished products are made by a shredding and rack-drying process that resembles papermaking. Nori is commonly used as a wrap for Onigiri and Makizushi. Nori is sometimes translated laver in English, but the term usually applies to plants of the genus Porphyra and not to the finished edible sheets of nori. The English term is in any case not well known, and in the United States, the term nori is more common. Other edible algaes commonly served in Japan include wakame, which is usually dried nori baked and seasoned with sweet soy sauce. This page was last edited on 5 April 2010, at 10:10.